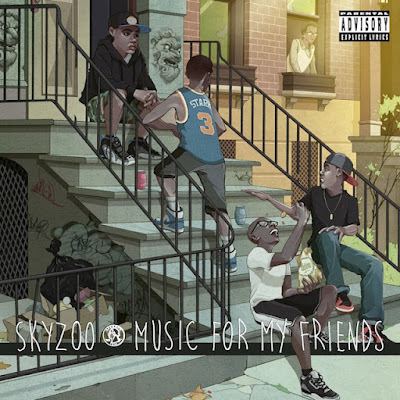 Last month Skyzoo dropped his third solo LP, Music For My Friends. Once again Sky weaves intricate reflective narratives, but this time he give us his perspective through the eyes of a young teen. The 15 track (16 if you get it with the bonus single, Falling out the Sky) LP is packed with damn near a different producer per track. Despite the ratio of tracks to producers, the album does not suffer from a disjointed identity. As a whole, the sounds and themes flow effortlessly from one track to the next. Sky also sticks to his formula of not having too many features (or actually featuring more singers than emcees). For this project Skyzoo taps Westside Gunn, Jadakiss, Black Thought and Skarr Akbar for help with emcee duties. He even scatters voice overs of his friends throughout the album. The intro (All Day, Always) begins with a young boy welcoming the listener to the album. But the track that made me hit repeat first (multiple times) was Money Makes Us Happy featuring Black Thought and Bilal. The Rvlt produced track (I was not able to find ANY info on the producer, so if uall know who it is let us know) sets a soulful/jazzy foundation of steady drums, pianos and a mixture of other electronic instruments. The "young" Skyzoo is talking to an older Black Thought and telling him what he has learned so far. Money is happiness and he is going to do whatever it takes to get it and keep it. His aspirations are to surround himself with material wealth even if there are physical consequences, "It was money and it was cars and it was habits to keeping both/ It was hundreds and it was scars and they just happened to be close." Black Thought tries to guide the young emcee by telling him that money can change you into someone who you don't recognized and hate. As someone who has had success, Black Thought reflects on how money has caused more problems than solutions, "We want more but need less, desires and requests/ I guess moving constantly at this rapid speed just/ Effected my velocity, then the evil got to me/ And strangely, it [messed] around and changed my philosophy." Before the last hook, Bilal bridges the verse with, "Money/ No surrender now and no restraints/ No complaints/ Lord knows the price will only raise." The last line sums up Sky's message in the track. Money might buy you happiness, but the price will always go up. Skyzoo has proven time and time again that he is an upper echelon emcee. The Brooklyn artist meticulously curates poetic sagas with a masterful flow. Yes, he can give you a drum and base heavy banger like Suicide Doors (which still is just as strong lyrically), but I feel he truly shines when he gives us genuine introspective rhymes. With Music For My Friends, Skyzoo paints the all to common picture of young kids who are obsessed with mimicking the lifestyle of rappers, athletes or dealers. When you have so much life in front of you, time is not as important. But Sky knows that many lose time that they will never get back. In the end it is all about perspective. Unfortunately money is essential for many things, but the means matter just as much as the ends. A great emcee is able to highlight specific social and individual subjects to spark a conversation. I guarantee that every time you hit replay, you will hear something new. I got my album for the rest of the summer, uall should pick it up and do the same. Peep Luxury music video below. And album stream!